New Year, New Order. Let's start it off right. They say that a friend in need is a friend indeed. Agent Timopotamus started bumping an unlicensed freighter piloted by a carebear named rajehem. The carebear didn't seem to care much about his own safety; he was flying an Obelisk despite having a kill right available on himself. Timopotamus was a true gentleman of highsec. He reminded the hapless freighter pilot about the kill right and offered a way out of the perilous situation. With some reluctance, rajehem agreed to make a payment of 300 million isk. Sadly, he did what nearly all potential ransom-payers do: He stalled for time. 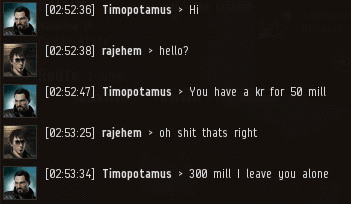 Eventually, the 300 million isk payment was sent. 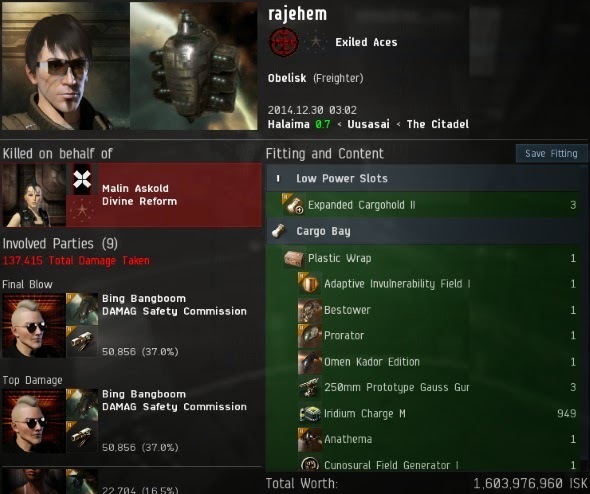 However, rajehem really ought to have made it a payment of 310 million isk. He still lacked a mining permit, something which all freighter pilots in highsec require. But the story has a happy ending--the kill right on rajehem was activated, and his anti-tanked freighter was destroyed by Agents Bing Bangboom, jorajr, Mendeya, Arionu, Lament von Gankenheim, Janice Erkkinen, Vanilla Mooses, Armin Soprano, and Lilith the Angel. The Code was enforced, and everyone went home a winner. Even rajehem benefited from the experience, as he experienced the honour of having been ganked by our Agents in Halaima, the birthplace of the Code. 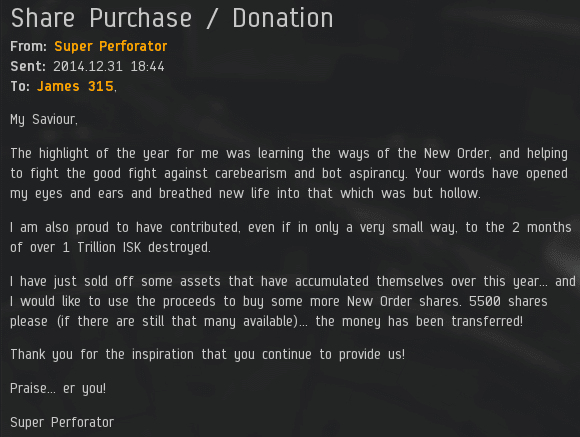 In celebration, Timopotamus bought 315 additional shares, sending us over the 515 billion isk mark and earning him a Supreme Protector's Tip of the Hat™. Not to be outdone, Super Perforator had cause for celebration, too: She noticed CODEdot's successful killing of more than 1 trillion isk worth of bot-aspirancy in the month of December. This motivated Super Perforator to purchase an additional 5,500 shares, sending us over the 516, 517, 518, 519, 520, and 521 billion isk marks. She got her very own Sextuple Supreme Protector's Tip of the Hat™. Now that's how to ring in the New Year! Still losing that 100 billion somewhere. I think it was just a typing error. I'm sure it will get rectified at some point, when the saviours got some free time to correct the error. Wow, I took a couple months off to get caught up with school work and I come back to the entire AG defeated and in disarray and Gorila on board with the good guys! Time to dust off my cats and get back into the fight! I'm missing out on all the fun! Glad the story made it. The CODE always wins! I thought Jimmy was infallible! Seems his memory is a bit off though. He's mistaken the country of New Order shares, and was too bot-aspirant to double check his article! Much like the lowly miner, he just wanted to hit submit and go AFK immediately. What a glorious way to kick off the New Year... the CODE always wins! JUST NOT AT MATH HAHAHAHA! !